Clean and tidy 5 bedroom 3 bathroom house. Big balcony to take in the wonderful view. Great entertaining areas. Three bedrooms have queen size beds and two have a total of 7 single beds. Two large entertaining areas - including a table tennis table. Laundry facilities including dryer. Downstairs has been fully renovated. Fully self contained. Plenty of parking for cars and boat. Only 20 metres to beach. Big backyard for children. Suit two families. 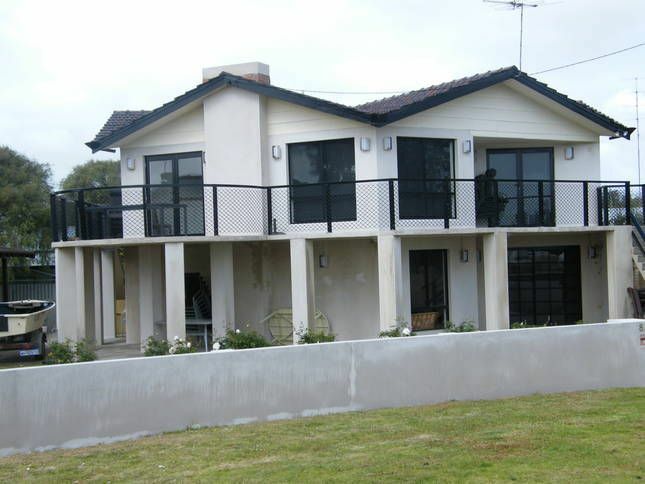 Walking distance to Busselton Jetty, Observatory, Nautical Lady fun park, town centre, shops, restaurants. Minutes from magnifcent surf and fishing beaches and wineries. The house was a great family house. It served our family well. The location is excellent. The house was a great family house. It was perfect for our family. The location was excellent and we will definitely come back. Spacious Older style property that comfortably slept 10 adults in an excellent location within walking distance of the pubs/jetty and views of the beach from the balcony. Good place for a relaxed group weekend away. Great Location but very random house. The location was great but we were disappointed with the interior when we arrived. The main bedroom is big and spacious. The outdoor area was good for kids to run around. The bathrooms are of the 70's era. The oven in the upstairs kitchen did not work, we used the kitchen down stairs. The vinyl on the floor down stairs was ripped and sticking up off the floor. The down stairs bedroom with the bunks is a garage that has been converted to a bedroom. It was not very nice and pretty much like you are sleeping in a garage. There is a lot of junk and other pieces of building material around the property. This propert could be really great but needs a lot of tlc. Yes, it is an older house inside, but usually clean. The oven does work. instructions have been put on the fridge. All mess has been cleaned up and some new furnishings inside. If you like locaction over luxury then this is for you. We had a great weekend here. there was plenty of room, everything we needed and the location was great. An ideal place for a family or group of friends. We really enjoyed our stay. We only used the upstairs area and spent a lot of time across the road at the beach. It would be great for 2 families as it can sleep and entertain lots of people. It was clean with some old furnishings of which some need replacing.